Serrano Salsa is a classic Texas Mexican table salsa. If you’re from this region, send me an email or comment about how you’ve savored this in your home. Amá (we did not use the Spanish word, mamá) always had this salsa on the kitchen table. 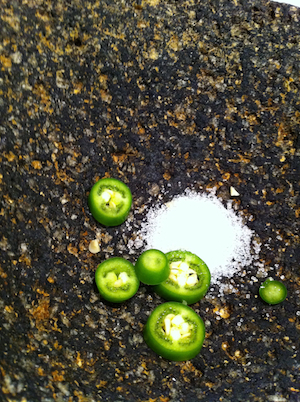 The straight taste of chile Serrano and salt is a beautiful thing. I’ve never seen this table salsa in any Mexican restaurant. If you haven’t obtained a molcajete yet, you can use a spice grinder or a small blender. You can add diced tomato, onion, garlic if you want to make it into a Salsa Ranchera or Salsa Mexicana, but sometimes raw simplicity is best. To this day Serrano is my favorite chile. The fresh, green taste is prominent, much more so, I think, than in the Jalapeño which is more neutral. We’d take a flour tortilla, spread some pinto beans on it, and then top it with this salsa. That’s all. Why gild the lily? Place the ingredients in the molcajete and have fun! Fiesta supermarket has plenty of molcajetes. As do vendors at the airline market. I can’t remember the last time I’ve had a fresh serrano pepper. You’ve just inspired me to track some down–and see if I can grow some next summer.